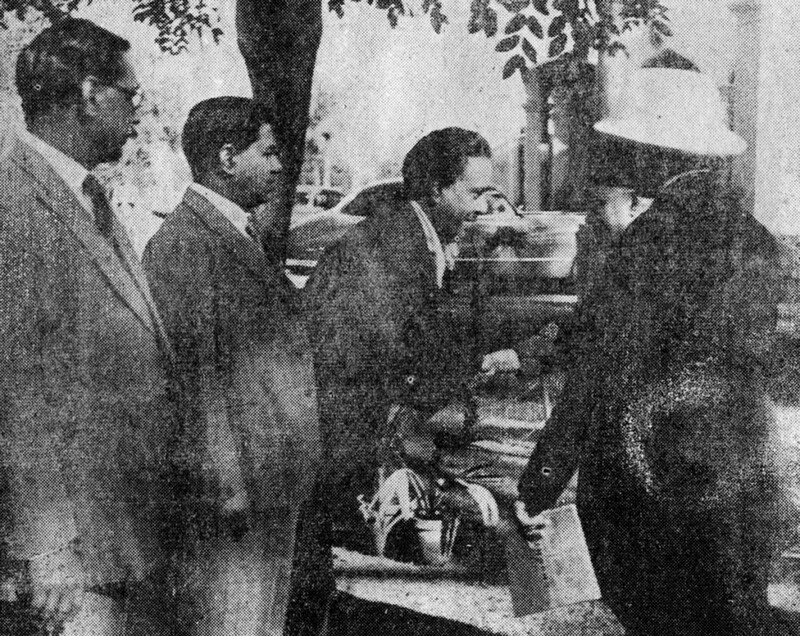 Prime Minister Liaquat Ali Khan and M.A. Rahman Chughtai were in communication with each other, even before Pakistan came into being. Later the Prime Minister recognized the role the artist could play in promoting the Ideology of Pakistan abroad. One decision made was the establishment of Art Councils all over Pakistan. And M.A. Rahman Chughtai was part of them all. In 1949 Pakistan Arts Council Lahore, named as Alhamra, was inaugurated by Governor General Khawaja Nazimuddin, with a show of M.A. Rahman Chughtai. Prime Minister Liaquat Ali Khan also came to that show with the Shahinshah of Iran, on 5th March, 1950. It was the start of a bold cultural tradition in Pakistan. 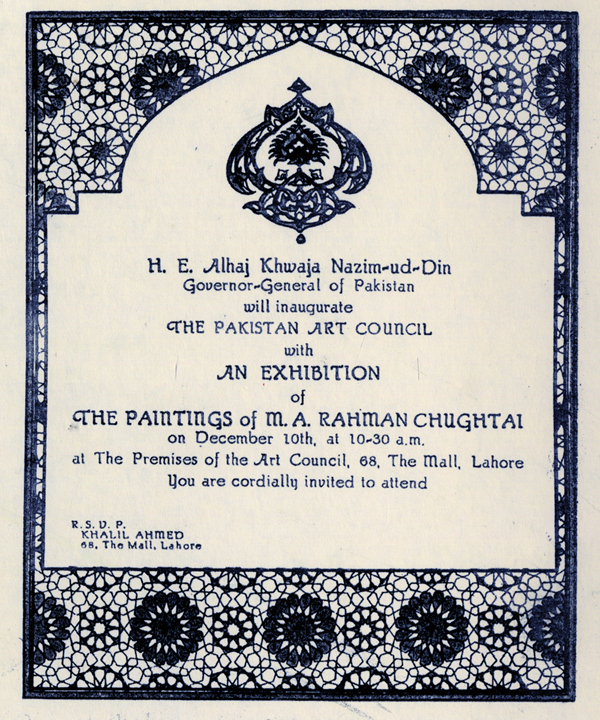 On 31st March, 1952, an exhibition of Chughtai’s works was held at YMCA Hall in Karachi, and inaugurated by the Governor General Ghulam Muhammed. Again Karachi became the centre of the start of cultural traditions in Pakistan. On 5th March, 1956, the Abbassin Arts Council in Peshawer was inaugurated with a show of Chughtai Artist at Peshawer. M.H. Zuberi Sahib was President of the Council and responsible for that show. Today one cannot even imagine what great response the Pathan brethren gave to that show in a literally cultural desolate city. Iskander Mirza became the Chairman of the Council and N.M. Khan became the Chief Secretary of the Council. 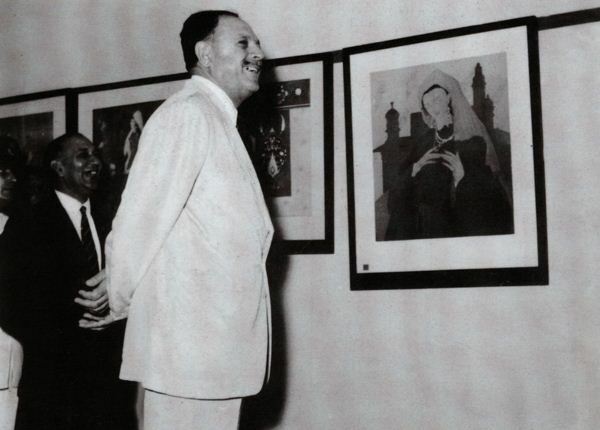 On 14th August, 1959 the Karachi Art Council was inaugurated by General Muhammed Ayub Khan with a show of paintings of M.A. Rahman Chughtai. It was a grand show, attended by diplomats of many countries from abroad. It spoke of the tone of Pakistan culture. The establishment of Art Councils was not in vain. It spread the message of peace, good will and advancement all over the world. But that was before they were taken up by moronic people in control of the affairs. With paid finances from foreign lobbies, they played havoc with the Ideology of Pakistan. But M.A. Rahman Chughtai tried his best for his country and his Art is playing its best in the world of today for Pakistan. A deliberate conspiracy of morons to de-rail the Ideology of Pakistan.